Winning the governorship plus majorities in both houses in 2010, Republicans seized the golden opportunity to dominate the decennial process of redistricting the state as never before. They had new voter boundaries drawn up behind closed doors by private law firms that would be paid by taxpayers. GOP legislators were made to sign oaths of secrecy before they could view their own redrawn districts. Rushed to beat six state Senate recall elections, the maps were quietly signed into law by Gov. Scott Walker on election day, Aug. 9, 2011. The new maps brought immediate lawsuits, as well as pointed rebukes from judges protesting the law firms' frivolous motions and withholding of evidence. One suit decried the disenfranchisement of more than 300,000 voters who would have to wait six years to vote for their state senator instead of the usual four. Another suit charged that the plan diluted Latino voting power. Ultimately costing the state more than $2.1 million, the battle over the redistricting process resulted in two districts being revised to comply with the Voting Rights Act. Even then, the Government Accountability Board discovered the new maps to be rife with errors. Due to a GOP mandate that reversed the longstanding practice of local officials drawing their precincts first, thousands of voters were placed in the wrong districts. Nevertheless, the gambit paid off for the Republicans, cementing electoral advantages that will last to 2021. They claimed five of eight congressional seats in 2012 despite winning less than half of the state's votes for Congress. They also won 55% of contested state Senate seats with only 45% of the vote, and 57% of Assembly races with 48% of the vote. So it is hardly surprising that in the wake of such historic gerrymandering, there have been repeated calls from Democrats, newspaper editors, good-government organizations and even some Republicans for a transparent, nonpartisan redistricting process that provides for equal representation at a fraction of the cost. Two bipartisan reform bills currently before the Legislature, AB 185 and SB 163, seek to do just that by emulating the system of neighboring Iowa, the proven gold standard of drawing political boundaries fairly. Republican leaders have refused to hold a public hearing on the bills since they were introduced last spring, so Senate authors Dale Schultz (R-Richland Center) and Tim Cullen (D-Janesville) are hosting their own public meeting Feb. 10 at the Capitol. One of the confirmed speakers is Ed Cook, legal counsel for the Iowa Legislative Services Agency, the state's nonpartisan map-drawing agency. In place since 1981, Iowa's redistricting procedure is noted not so much for the data it considers as for the data that cannot be considered. While providing equal representation and following county and municipal boundaries are of prime importance, the rules decree that no weight can be given to a precinct's voting history or even where the incumbent resides. Demographics are also off limits, excepting racial and language factors that must be considered to comply with the Voting Rights Act. The two redistricting reform bills follow Iowa's strictures in spirit if not to the letter. Wisconsin and Iowa differ in fundamental ways regarding population, diversity and geography, and exceptions have been made to some rules. For example, Iowa dictates that congressional districts must be composed of whole counties. However, the highly concentrated population of Milwaukee makes this impossible in Wisconsin. Iowa's terrain also presents a flat, dry table to work upon compared to Wisconsin's many hills, shores and rivers. 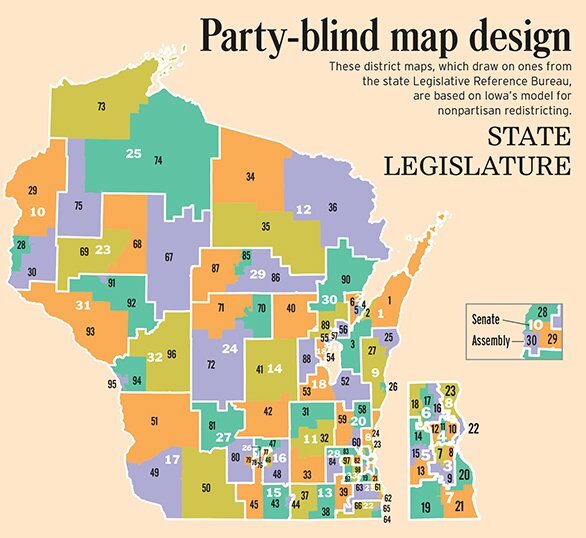 At the request of Cullen's office, Wisconsin's Legislative Reference Bureau has designed maps that redraw the lines in a party-blind manner. "We wanted to know, if SB 163 was the law, what would have happened in 2012," says Cullen. Using the same 2010 census data, these maps are the first state-produced examples of a Wisconsin free from the grip of the gerrymander. Senate Bill 163 sets forth specific standards for drawing voter boundaries. Forming equally populated districts is a paramount consideration, and in this regard the Legislative Reference Bureau maps comply with the strictures of the bill. The population of each district drawn falls within the allowable deviation from the "ideal population" of equally populated districts, as do the maps in effect now. Like Iowa's law, SB 163 also seeks to limit the wild meandering of district lines by sticking to long-established political borders. While the bill does not explicitly say that congressional district lines should run along county lines, it does say that splitting counties, cities, villages and towns should be kept to a minimum. It also says that if splitting is necessary, the most populous subdivisions should be split first. The Legislative Reference Bureau applied this dictum rather loosely when drawing the maps. 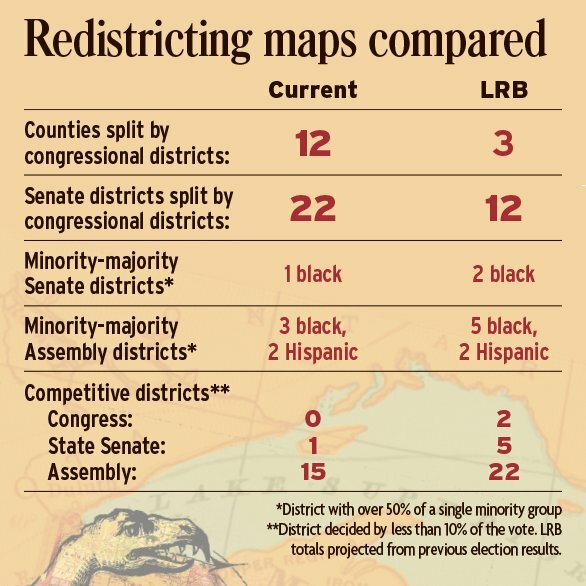 While splitting Milwaukee County is unavoidable in drawing the congressional districts, the Legislative Reference Bureau splits it twice, and also divides Rock and Outagamie counties. The standard set in SB 163 would suggest that if a second county needed to be split, it would have been Dane, the second most populous. Instead, ninth-most-populous Rock County is cleaved down the center, cutting Beloit in two. The Milwaukee suburbs of Wauwatosa and Greenfield are also broken in two. Is there an alternative map that better fits the guidelines of SB 163? Given my own fascination with maps and puzzles, I was able to come up with a congressional district map that split only Milwaukee County without splitting any municipalities. Click here to view this map. SB 163 also states that "each congressional district must contain whole Senate districts, to the extent possible." That's a challenge considering there are 33 Senate districts to try to fit cleanly into eight congressional districts. The Legislative Reference Bureau ended up splitting 12 Senate districts, although they again are not the most populous. The most glaring example where a guideline is not followed is the 18th Senate District, which is not contiguous (in one piece). It wraps around the southern end of Lake Winnebago, with the 53rd and 54th Assembly Districts separated by the 88th in a three-way split of Oshkosh. That city would make out pretty well in this redraw, netting three representatives in the Assembly and two in the Senate. Much larger cities such as Kenosha and Racine would have to make do with two Assembly reps and one state senator each. How could SB 163 allow for such deviations from its own rules? It does so by providing for a bipartisan Redistricting Advisory Commission that would direct the Legislative Reference Bureau on such judgment calls, and also allow for the legislative input that GOP lawmakers have claimed such reforms would deny. The majority and minority leaders of both houses would each choose a member for the commission, with the final member chosen by the first four -- no partisan office holders or legislative employees need apply. The Redistricting Advisory Commission would also be responsible for shepherding the process along in an open and timely fashion, conducting at least three public hearings on any plan. If it had been enacted, the most immediate effect of this redraw would be the many incumbents arbitrarily placed in the same districts. While some pairings would have made for natural opponents, both parties would have faced intramural contests. Voters in a new 84th Assembly District might have seen a primary between Republicans Joel Kleefisch and Chris Kapenga. In Madison, Democrats Brett Hulsey and Terese Berceau might have had to face off in a new 78th. In a four-way incumbent battle royal, Republicans Steve Nass, Evan Wynn, Amy Loudenbeck and Democrat Andy Jorgensen might have had to vie for the same seat. Perhaps the unluckiest pol in this shake-up would be U.S. Rep. Paul Ryan. Losing his 1st District toehold in northeast Janesville, he would either have to square off against Rep. Mark Pocan in a new 2nd Congressional District or relocate closer to Lake Michigan. It also might have led Mitt Romney to choose a different running mate rather than one who stood a good chance to lose his House seat in the same election. Considering the advantages Republicans have built into the current maps, any party-blind reshuffling of the deck could only yield gains for Democrats. Using the 2012 presidential election as a metric, the data confirm that presumption. Under the boundaries currently in effect, if voters had stuck with the same party for their legislators as for their president, today's Assembly would contain 43 Democrats and 56 Republicans (despite Obama winning the state with 53% of the vote). If the Legislative Reference Bureau map had been in place and that same measure used, the makeup would have been 55 Democrats and 44 Republicans, which would be closer to the actual Assembly vote totals of 53% and 46%, respectively. However, the balance of the state Senate would have likely remained the same at 16 Democrats and 17 Republicans, perhaps due to the fact that only half the new districts would have been up for election. But what if a different metric is chosen, one that uses an election year favorable to Republicans? Using the Legislative Reference Bureau maps, if district voters' party choices for governor in 2010 were applied to their choices for legislator, the Assembly would contain 68 Republicans and 31 Democrats. Using U.S. Sen. Ron Johnson's election as a yardstick would yield similar results: 65-34. In both scenarios the GOP would claim about two-thirds of the Assembly, while each GOP candidate's victory was only 52%. Nevertheless, in contrast to the present Legislature, the majority party would still rule. 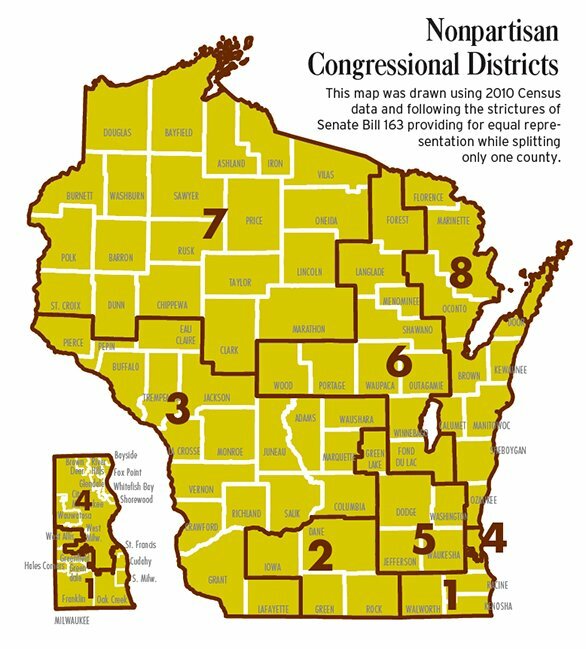 If a competitive district can be defined as one whose election is decided by fewer than 10 percentage points, then today there are no competitive congressional seats in Wisconsin. Three are safely held by Democrats, five by Republicans. The nonpartisan maps would have upset that status quo, turning the 1st and 7th seats into swing districts. 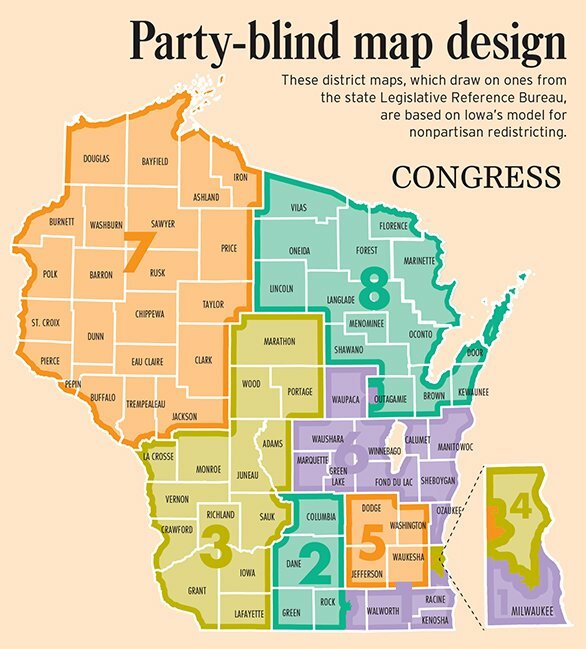 If voters' 2012 party picks for Congress had remained the same for the Legislative Reference Bureau's hypothetical map, the Democrats would have flipped the 7th Congressional District from red to blue, striking a 4-4 balance in Wisconsin's House delegation that matches the actual 50% Democratic total congressional vote. If voters' 2012 party choices for Assembly were applied to the nonpartisan map, a total of 22 districts could be projected as being competitive, an improvement over the current 15. No matter how fairly they are drawn, these maps (or any alternatives) would still have to pass both legislative houses, and could be vetoed by the governor for any or no reason at all. At that point revised plans would again be submitted to the committee-driven legislative process. If still no agreement were reached, the maps would then be drawn by the courts (as they were in 1982, 1992 and 2002). Legal challenges could still be brought, particularly if any map was seen as violating the Voting Rights Act. In the 30 years Iowa has been practicing nonpartisan redistricting, there has been only one instance of maps requiring a second vote. Attorneys have never been hired, and Iowa has yet to resort to maps drawn by the courts. The total cost of its system has been almost nonexistent, with funds needed primarily for printing and the gasoline to drive the printed copies to outstate hearings. Regardless of the promise of such reform for Wisconsin, Sen. Cullen does not hold out much hope for quick action. "This issue will only change after the fall elections," says Cullen, who, like Schultz, is not running for reelection. "There's not a question in my mind that Fitz and Vos are not going to allow hearings on these bills," he adds, referencing Senate Majority Leader Scott Fitzgerald (R-Juneau) and Assembly Speaker Robin Vos (R-Rochester). Yet Cullen believes that educating the public might prove more valuable in the long-term than buttonholing legislators. "Most of the problems around here," he says, "are going to get fixed from the bottom up." Here is how the GOP strengthened its grip on Wisconsin state government. Freshman Republican Rep. Sean Duffy was bolstered with the addition of fast-growing, conservative St. Croix County to the 7th Congressional District. Democratic U.S. Rep. Ron Kind was helped when the GOP created an arm connecting liberal Portage County and the already Democratic 3rd District, while also netting progressive-voting areas like Eau Claire and Wisconsin Rapids. Anticipating the retirements of U.S. Reps. F. James Sensenbrenner and Tom Petri, GOP leaders Scott and Jeff Fitzgerald were the convenient recipients of a district line running between their homes, ensuring the brothers need not compete against each other for future congressional seats. To shore up U.S. Rep. Paul Ryan's district, the GOP kept a toe in Ryan's Janesville, cut loose more of Democratic Rock County and added some of Waukesha County's most conservative suburbs. Senate recall challengers Fred Clark of Baraboo and Nancy Nusbaum of Brown County were drawn out of the districts they hoped to represent. If they had won they would have had to relocate before they could be reelected to the same seat. Sen. Alberta Darling's 8th District jettisoned liberal suburbs like Shorewood, where the effort to recall her was launched. As a result of a lawsuit by Voces de la Frontera, a three-judge panel ordered the 8th and 9th Assembly districts be redrawn to address the splitting of a Hispanic voting bloc and to comply with the Voting Rights Act. The cities of Racine and Kenosha were packed into one Senate district while their respective counties were carved vertically to create a safe GOP district to the west that cut out longtime Democratic state Sen. Bob Wirch. Here's a congressional district map that splits only Milwaukee County without splitting any municipalities.